A good outlet for social emotional issues. Here's an artful way to put a tomato trellis to good use...turn it into a Wishing Tree! 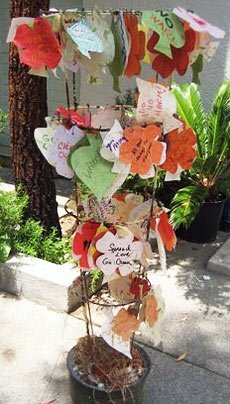 Simply take a metal tomato plant trellis, put it into a soil filled pot and have children design their own wish to attach it to the "tree". 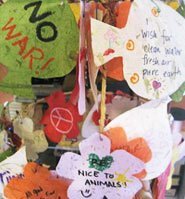 These wishes were created on rice paper, but you could also use hand-painted paper or construction paper with collage materials on top. With summer coming up, you could even create this to decorate an outdoor vegetable garden. This creative idea came from a volunteer at A Window Between Worlds, a shelter for battered women and their children in Venice, CA.